Check out these *POPULAR* Personalized Stainless Wine Tumbler $15.99 (Retail $24.99). 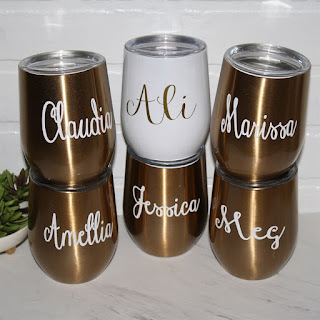 Drink in style with these adorable personalized stainless steel tumblers that last from your morning coffee to your evening wine. Our powdered coated steel wine glasses are vacuum double-wall insulated with a copper coated inner wall helping your wine stay at the perfect temperature. Drinks stay cold for up to 24 hours and hot up to 12 in these cups. They even include a BPA free push seal lid to help take your drink on the go! The tumblers hold 9 ounces with the lid on (a full 12 ounces without the lid). They are personalized with a high quality outdoor rated vinyl designed to weather any storm but we do recommend hand washing these wine glasses.